Researching the history of fashion and costume online has taken grand leaps recently. In part to sort out the best from the rest, I have a short series of posts here on digital costume and fashion image collections now available to the public online. I thought I'd start with the Los Angeles public library, because a girl has to have some loyalty to her home base. The Casey Collection of Fashion Plates consists of original fashion plates, spanning the years from 1780 to 1880. 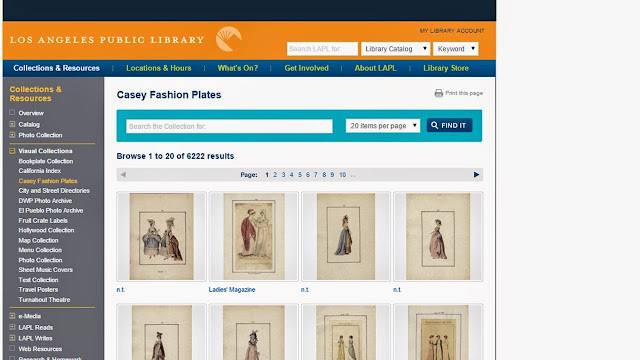 This huge collection has over 6,200 images, and that's alot to sort through, but the search engine is easy to use when looking for a specific year's costume plates. The images come from both American and British publications. Overall review: I found this huge site to be well organized and easy to search. The images are easy to enlarge using a touch screen and the quality of those enlargements is excellent. I would recommend this to anyone needing a large body of images for research on a specific year or era between 1780 and 1880. Improvements: I would have liked each image to be dated in the general search pages, as they are not in chronological order. The search is by year only, terms and other details cannot be searched. I would like to be able to search by decade, rather than having to enter 10 searches in order to see a decade of plates. Search: "search collection for" box will bring up images by YEAR only. Does not search by decade or garment type. Speed: I found this to search and load quickly.